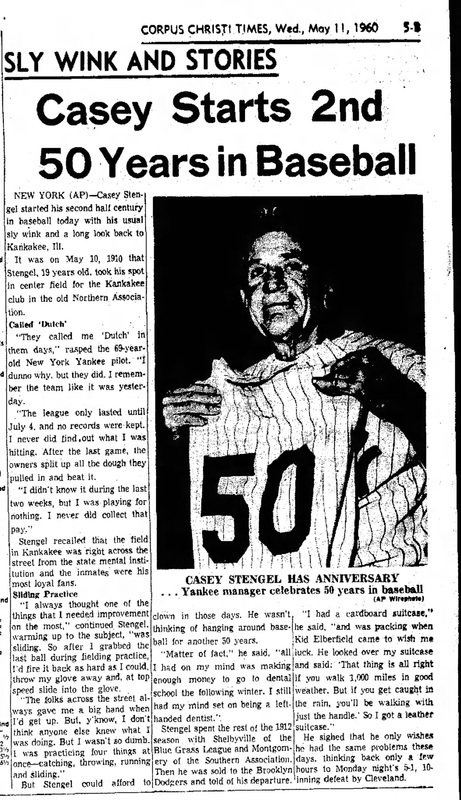 NEW YORK (AP)--Casey Stengel started his second half century in baseball today with his usual sly wink and a long look back to Kankakee, Ill. It was on May 10, 1910 that Stengel, 19 years old, took his spot in center held for the Kankakee club in the old Northern. Association. "They called me 'Dutch' in them days," rasped the 69-year- old New York Yankee pilot. "I dunno why, but they did. I remember the team like it was yesterday. "The league only lasted until July 4, and no records were kept. I never did find out what I was hitting. After the last game, the owners split up all the dough they pulled in and beat it. "I didn't know it during the last two weeks, but I was playing for nothing. I never did collect that pay." Stengel recalled that the field in Kankakee was right across the street from the state mental institution and the inmates were his most loyal fans. "I always thought one of the things that I needed improvement on the most," continued. Stengel. warming up to the subject, "was sliding. So after I grabbed the last ball during fielding practice I'd fire it back as hard as I could, throw my glove away and, at top speed slide into the glove. The folks across the street always gave me a big hand when I'd get up. But, y'know, I don't think anyone else knew what I was doing. But I wasn't so dumb. I was practicing four things at once—catching, throwing, running and sliding." But Stengel could afford to clown in those days. He wasn't thinking of hanging around baseball for another 50 years. "Matter of fact," he said, "all I had on my mind was making enough money to go to dental school the following winter. I still had my mind set on being a left-handed dentist." Stengel spent the rest of the 1912 season with Shelbyville of the Blue Grass League and Montgomery of the Southern Association. Then he was sold to the Brooklyn Dodgers and told of his departure. "I had a cardboard suitcase." he said, "and was packing when Kid Elberfield came to wish me luck. He looked over my suitcase and said: 'That thing is all right if you walk 1,000 miles in good weather. But if you get caught in the rain, you'll be walking with just the handle.' So I got a leather suitcase. He sighed that he only wishes he had the same problems these days, thinking back only a few hours to Monday night's 5-1, 10-inning defeat by Cleveland.